Payment of Salaries/ Pensions to TS Employees/ Pensioners on 25th September, 2017: Payment of Salaries to the Telangana State Government Employees & Pensions to Pensioners in advance on 25th September, 2017. GOVERNMENT OF TELANGANA, FINANCE (TFR) DEPARTMENT G.O.Rt.No. 1147, Dated: 13-09-2017 SALARIES - Payment of Salaries to the State Government Employees & Pensions to Pensioners in advance on 25th September, 2017 instead of 1.10.2017 in view of Bathukamma and Dassera Festival- Orders - Issued. ORDER: In the reference 1st read above, the Principal Secretary to C.M. informed that Hon’ble C.M has ordered that in view of Bathukamma & Vijayadasami festivals falling in last week of this month, all Government Employees be paid salary for the current month on 25.09.2017. 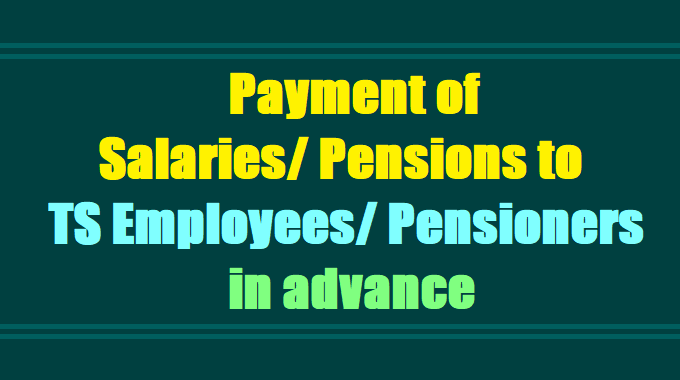 Government after careful consideration of the matter hereby decided to pay the salaries to the State Government Employees and Pensions to Pensioners for the month of September, 2017 in advance i.e., on 25th September, 2017 instead of 1st October, 2017 to enable the employees / pensioners to celebrate the Bathukamma & Dassera Festival on 28th & 30th September, 2017. The Director of Treasuries and Accounts, Telangana State, Hyderabad, Pay and Accounts Officer, Telangana State, Hyderabad and Director of Works Accounts, Telangana State, Hyderabad shall comply with the above orders for payment of salaries to the Government employees and pensions to pensioners in advance on 25.09.2017 instead of 01.10.2017, for the month of September, 2017 only.